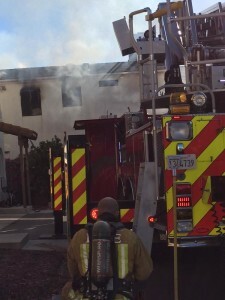 Shortly before 9:30 a.m. Tuesday, a fire broke out in an apartment building in the 1600 block of 21st Street. A faulty water heater sparked the fire. The blaze spread into two units in the building. After the fire began, a man working in a nearby office smelled the smoke. The man, Andrew Newman, ran into the building, knocked on doors and yelled at everyone to get out. Newman said he then ran outside and saw a man pressed up against a window. The man was trapped by thick smoke and quickly approaching flames. Newman yelled at the man to bust the window. The man then busted the window, hit the screen and jumped out, Newman said. As the man landed, Newman attempted to stabilize the 28-year-old jumper. Emergency medical personnel then transported man, who suffered non-life threatening injuries, to a nearby hospital. The scene played out in about five minutes, and it all took place before fire crews arrived, Newman said. Five Cities Fire Chief Steve Lieberman said he is really grateful Newman helped the man escape. Firefighters then put the fire out in a matter of minutes, Lieberman said. 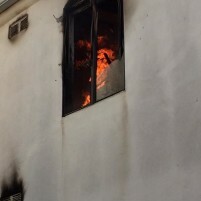 The fire displaced eight people. The Red Cross is helping them find housing. So much for all that tax payers money spent on reducing response time. “Fire fighters” probably too busy working out or hanging out at trader Joe’s before nap time on the tax payers dime. Thank goodness for the real hero, Andrew Newman…and he was free.